Donna Lewis: So many words. So few words. I"m so sorry for the families loss. Richard's work made a huge impression on me. My wife and I have made a contribution in support of Team Cul de Sac. I hope it helps. While I didn't know him personally, he would respond to my occasional e-mails. This must be so hard for all who loved him, and I send you my most sincere condolences. May happy memories ease your grief. I had never heard of the comic prior to meeting Chris Sparks at Free Comic Book Day a couple of years ago, where I bought the pre release box set on a whim. Richard's work is on par with Shulz, Hart and Watterson, and will be remembered far into the future. But from what I've seen of Richard these past couple of years, he will be remembered himself even longer than his work. May his memory be eternal. Richard's passing makes me want to rage at the world. How can it be fair to take first his livelihood and then his life, from a genius like Richard? I only knew Richard from his blog, so the best I can say truthfully is that he seemed like a great guy. But I can honestly say I loved, loved, loved his work. He will be missed. I flew to Columbus OH to meet the Master of Caricature and Cartooning. I brought along a little sculpture of iconic Alice on her iconic manhole cover. I hope he liked it a little bit. It was made with all the love and honor to him and her that I could muster and she flew about 2,394 miles on my lap on the plane to get there. (I'm pretty sure Richard would want to know the exact mileage.) It was wonderful to shake hands with him there...I think I did and to shake his hand again in Washington DC. I'm heartbroken at your/our loss. I was so hoping that new research would open up a way to help him. Love Dan McConnell from Washington, the state. I have been a huge fan of Richard Thompson's work since the earliest Richard's Poor Almanac started appearing in the Washington Post. (Or maybe it was from the first time I saw his illustrations for Gene Weingarten's columns... I forget which.) I own all his books, getting the signed copies when I could. (The Art of Richard Thompson is magnificent.) When he had to lay down his pen, I was very, very sad. It was too soon. But I could still follow his blog, so that provided a lingering connection--a sense that he was still out there, making mischief. Then he had to give that up, too. But even then, he was still around, and I would see his picture occasionally on social media--a wheelchair-bound but still-smiling presence at some event, surrounded by smiling friends and peers. Silently, I feared the day I would hear the news I heard yesterday. I am just a fan, not a personal friend, so I don't wish to go overboard on how this affects me. That should be reserved for his family and all those who had the privilege to know him. But Richard's passing does make me feel a deep sense of loss. 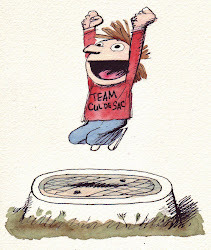 Cul de Sac was a masterpiece, and Richard Thompson was an extraordinary artist and a comic genius. I will continue to treasure the brilliant work he left with us. Please, Please, Please... if Team Cul De Sac does a tribute book for charity in memorium, have open submissions. I would love to be a part of something, and Richard Thompson's work effected a lot of cartoonists, even those of us that are not famous/un-published. I am a fairly recent devotee of Richards work (just the last 5 years). My heart broke when I heard of his debilitating disease, knowing that creative genius was going to be stifled. Now, my heart is singing knowing that he has been released from the terrible prison he was in. Of course, I will miss seeing the wonderful pictures of him smiling through his adversity. Richard gave us laughter, hope, and love. And in the end, he gave himself. Sleep sweet, Richard. I am so saddened by Richard's parting. Alice and Petey and the full cast of Cul de Sac will live in my heart forever. I teach music in middle school, and I have a lot of Cul de Sacs posted around my room. One of my favorite series was Petey and his oboe and the elf hats they wore at the concert. Oh, my gosh! Every time I look at Alice and Sophie breaking into gales of laughter at the concert, I giggle right along! I'm also humbled. On a larger scale, Richard's work cuts right to the child in every one of us. And to the vulnerability of parents. And to the humor and compassion in every moment of life, if we look close enough to have it revealed. Thompson family, please know your dear Richard's heart has reached far and wide. I will always treasure his beautiful, witty, hilarious, deep artistry.